We have 2 garages and a workshop filled with junk at the back of our home in France and every now and then, I long for the space to be converted into a Summer house. A place where we could host friends, a space I could use as a photography studio in Winter time, and somewhere where my growing teen Mila could hang out with her cousin and her friends. However, whether or not you have space at the back of your home, this inspiring garage converted into a Summer house is one to bear in mind for future projects. This converted garage has the same long rectangular shape than ours which makes visualisation easy. It has also a lot of features that I’m sure you will love too. Simple, modern lines and high-ceiling. Open-plan living, plywood walls (check these other amazing plywood kitchens projects). Large bay windows and consequently lots of natural light. Dreamy, isn’t it. Imagine owning a space like this…. 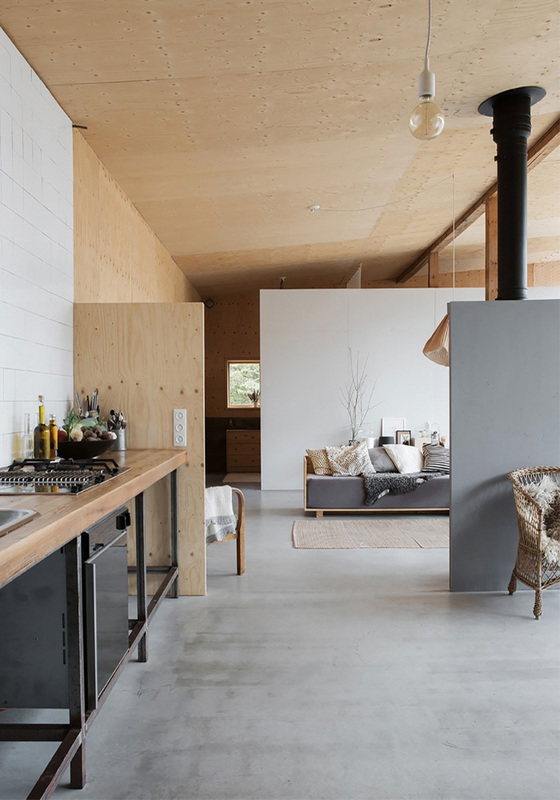 This converted garage on the Furillen island on the coast of Gotland (Sweden) was purchased by two Architects: Lotta and Henrik Imberg, founders of Stockholm-based Imberg Arkitekter. When they bought the building which was a military garage, it was merely a shell with no running water or any comfort by today’s standards. To get a feel of the place, they both camped out on the site before drawing any plans. Getting a feel of the light throughout the seasons is always something I recommend doing before embarking on major renovations. Eventually, Lotta and Henrik maintained a lot of the original elements such as the concrete beams, a lower wall bearing with marks from its previous military life and the concrete floor. They then improved the frame, replaced the roof, added a few plywood partitions walls to divide the space and fitted these great floor-to-ceiling windows. These large floor-to-ceiling windows and their wooden frames are by far, my favourite feature. How about you!? What is the thing you love the most about this place? Keeping a monochrome palette of greys, light wood and black throughout the house, the owners designed a Summer house with colours that echo beautifully the colours of nature surrounding the house. It’s a soothing balance of cold and warmth tones which work throughout all four seasons I think. Stonewashed linen adds an effortless stylish touch to the bedroom and exudes down-time. STYLING TIP: Similar soft stonewashed linen can be found on MADE.COM and EVE but I really love these linen sheets which are reversible and therefore, allow you to create two atmospheres with one bedding set in your bedroom. One day, I hope we will be able to build such a simple house right next to the ocean. Nothing fancy, just a big rectangular shape with bedrooms on each side of the space and open-plan living space in the middle like the one Steve and I saw years ago in Waihi Beach (New-Zealand). I would meditate on my deck, hang out in my linen bathrobe (you can order yours here), take my surfboard for a few hours and then spend the rest of the day pottering around the house sporting of one of these fab tops from Hush. What do you think of this house? What does your dream look like?? Yes I just wondered what they applied on the plywood partition walls to avoid them getting dirty. Just an amazing idea to convert the garage to summer house. Actually I’m planing to convert my garage to a party hall for Christmas party. So, do you have any suggestions?